BASKETBALL SPOTLIGHT NEWS: Future Phenom Camp Highlights: "Pure" Bliss! Future Phenom Camp Highlights: "Pure" Bliss! Christian Bliss put on a show at the Future Phenom Camp in Maryland. The point guard showed he could score against the some of the best players in the country. 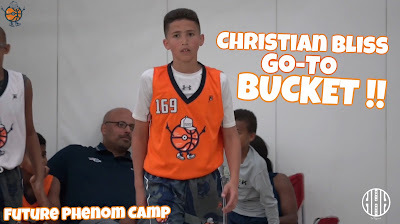 Check out his highlights from Future Phenom Camp! Spotlight Alum Muhammad Selects Ohio State! Super Skillcase Returns In November! Playtime Panthers Tryouts Are Here! Spotlight Alum Clarke Heads To Sacred Heart! Basketball Spotlight Circuit Is Released! Basketball Spotlight Alum Reddish Selects Duke!